Gigabyte has unveiled updates to its Aorus sub-brand of premium gaming notebooks at Computex, including the monstrously powerful X9 as well as updated X5 MD and X7 DT. Gigabyte has been very busy this past year updating and overhauling its notebook lineup, but the Taiwanese company isn't stopping to take a breather — even after the release of the impressive Aero 15. Gigabyte's premium gaming line, Aorus, is in need of updates as well, and they have delivered exactly that at Computex. 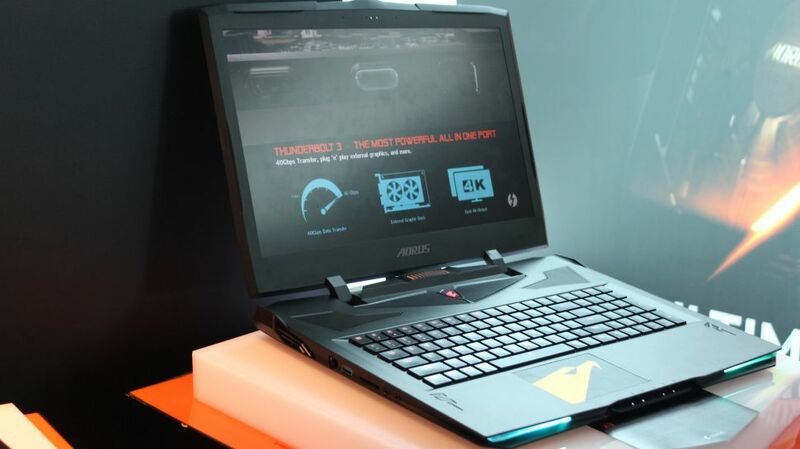 The biggest news in Aorus releases is the top-of-the-line X9 gaming laptop. A pre-production concept was on display in January at CES, but the chassis has been redesigned and the specs have been shuffled somewhat. The X9 fits a 17-inch screen (backed by twin Geforce GTX 1070s in SLI) and individually backlit RGB mechanical keyboard into its 30mm-thick chassis. The X9 should be available between October and November. The 15-inch X5 has been updated to the X5 MD. In addition to the latest Kaby Lake i7 (presumably the unlocked HK), it now packs a GTX 1080 in place of its predecessors 1070. The IPS display has also been upgraded from 3k to 4k, and will feature X-Rite Pantone certification, just like the Aero 15 (it appears that both the X5 MD and Aero 15 will be using the same 4k display). Additionally, the X5 includes a Thunderbolt 3 port instead of just USB Type-C. There is no word yet on availability for the X5 MD. Lastly, the X7 DT has been updated with Intel's latest CPUs and again adds Thunderbolt 3 and X-Rite Pantone certification to improve upon last year's model. The X7 DT is expected to be available this July.